Welcome to another Bookshelf Cleaning Giveaway at Passages to the Past! My bookshelves are threatening to explode and I need to find new homes for a few of my books and I'm counting on you, my lovely readers, to adopt them! Up for grabs this time is a duo of Shakespeare-inspired books...O, Juliet by Robin Maxwell and Mistress Shakespeare by Karen Harper. The giveaway is for one copy per winner, so when you sign up please let me know which copy you are interested in - you can choose both if you wish. A bold and intriguing novel about the woman who was William Shakespeare's secret wife, by the national bestselling author. As historical records show, Anne Whateley of Temple Grafton was betrothed to William Shakespeare just days before he was forced to wed the pregnant Anne Hathaway. Here, Anne Whateley takes up her pen to tell the intimate story of her daring life with Will. Obliged to acknowledge Will's publicly sanctioned marriage, Anne Whateley nevertheless follows him from rural Stratford-Upon-Avon to teeming London, where they honor their secret union, the coming together of two passionate souls. Persecution and plague, insurrection and inferno, friends and foes all play parts in Anne's lively tale. - To enter, please leave a comment below letting me know which copy you would like to receive and include your email address (only comments with email addresses will be entered in the giveaway). - Giveaway ends on September 24th. Both books sound wonderful and I would be happy to win either, but, as you insist we choose one, I will say Mistress Shakespeare by Karen Harper. I have always been intrigued by Shakespeare. Hi Marjorie - I'm sorry I wasn't more clear, you can sign up for both books if you are interested in either one, though you will only win one of them. I will edit your entry and sign you up for both. 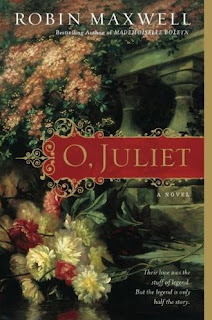 I would love to read O Juliet... another lovely giveaway! Thank you. Hi Amy! How kind of you to share your bookshelf :) I'd love to win either one really, but if I was picking between them, I'd say Mistress Shakespeare. They both sound really good though! I'm already a GFC follower and a follower of the Facebook page. I tweeted and posted the giveaway on Facebook. So nice you are sharing your loves with us..I know how hard it can be to give books away! I have Mistress Shakespeare so I would love a chance to win O, Juliet! +3. Facebook follower of page (Colleen Turner). +1. Shared on Facebook and GoogelBuzz. we would love to win either one of those books to add to the family library. I would be over-joyed to have either book! I'd also be okay with either book as I have not read either! I'm already a follower!! Wonderful! Both sound interesting but would love to read Mistress Shakespeare. I'm a follower gfc, email and on fb. I would love to be entered for Mistress Shakespeare by Karen Harper. I really love her books. Hello, What a blessing, just to be entered in this wonderful drawing. I would love both books as they sound as if they will be such a joy to read. Thank you again. Hi Marjorie, I would love both books. Thank you! I would love to win either/both! I am a follower. 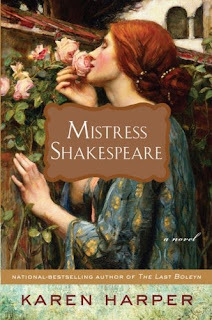 I really enjoyed O, Juliet when I read it, but since I already own it, I'd love to have a copy of Mistress Shakespeare. And I'm a follower. Ooohhh both sound very interesting! !I`d enjoy reading either one. I have always been intrigued by Shakespeare and the "behind the scenes" story of his life. "Mistress Shakespeare" is a book that I would dearly love to read. The synopsis of this book and their love story sounds delightful and I'm hoping to be lucky enough to win this lovely book. Many thanks for the giveaway. I'm interested in both books! I would like to be entered for either book, they both sound great. What a lovely giveaway. I've had Mistress Shakespeare on my wish list for some time now. So I would love a chance to win it. Thanks so much, and I've been a Google follower for a long time. I would love to read Mistress Shakespeare. I would prefer to win O Juliet. +5 I follow with GFC as Sandra K321. Yay! Amy has books to give away! I love when you toss stuff our way :-) Since I already have Mistress Shakespeare, please enter me for O, Juliet. Thanks so much! Both books are on my TBR list, and I would love to win either one! I would love to read O Juliet. O, Juliet would be my choice. Thank you Amy. Thanks for the giveaway! Both sound interesting. I want to read O Juliet! I'd love to read both, but I'll pick Mistress Shakespeare for my choice. I would love to read Mistress Shaekespeare. What a beautiful love story. I am a follower! I would love to read O, Juliet by Robin Maxwell! this entry is for O Juliet!!!! i'm a follower, fb page 'liker' & spread the word on the giveaway!!! this entry is for Mistress Shakespeare!!!! I would love to have Mistress Shakespeare. Since I already have O, Juliet, Mistress Shakespeare it is! Thanks for the chance. Thanks for another great giveaway! I'd like to win O, Juliet; I love reading retelings of classics books. I've joined the FB page. Amy, you are so generous! I have O'Juliet on my tbr list because I've loved tJuliet sonce I first read Romeo and Juliet when I was a teenager..I want to read this version of the story especially with Juliet as the focus! +3 I forgot to mention that I also "like" your FB page and follow you on FB! Mistress Shakespeare sounds wonderful, too! I'd love the chance to win this book, as well. +3 I "like" your FB page and follow it! Thank you for offering these beautiful books as a giveaway, Amy! I would love to have either book! They both sound good!